Disclaimer: This head-to-head comparison is comprehensive… and over 7800 words long. It’s a lot, we know! You’re welcome to read the entire article or jump around to sections of interest using the Table of Contents and Back to Top links. We hope that helps. Enjoy! Insightly and Base — two popular, capable CRMs known for their wide ranges of features. From contact, task and lead management to marketing automation and sales reports, both Insightly and Base have the tools to satisfy a wide range of business use cases, and each has an ardent user base that swears by their solution as the greatest application to grace their data since the spreadsheet and word processor. So which CRM is better? Of course it depends on your business needs, but there are enough common needs and overlapping features to warrant a head-to-head comparison of the two platforms. This will provide a sense of how each platform might fulfill your use case — and which one, potentially, could do it better. Feel free to check out our individual provider overviews for Insightly and Base. Let’s get right into Insightly vs Base – a head to head comparison – and find out how each holds up against the other. Any CRM worth its salt will have an interface that’s navigable, quick-loading and easy on the eyes. There are only so many ways to present an efficient layout of tools; generally, CRMs present key features on a navigation panel, positioned either on the left or across the top, with the more technical functions accessible from a User Settings-type page. Insightly and Base both adhere to this basic layout, with Insightly opting for the left-hand navigation panel and Base presenting it horizontally above the page. Insightly’s layout lays its key features on a vertical panel on the left side of the screen. The default panel displays the names of the features, and it can be shrunk to show only icons. The panel shows your Home view — which is an activity feed filterable by type and user — followed by Tasks, Contacts, Organizations, Leads, Opportunities, Projects, Emails and Reports. Each category is fairly self-explanatory. There is a horizontal panel above the page with a button to add a new record, search data, access your calendar and additional settings options. Clicking your avatar in the top right opens a drop down menu with options such as Help, What’s New, Keyboard Shortcuts, User Settings, Color Theme, System Settings, Billing & Account, and Log Out. Clicking Help opens a browser tab directing you to their support page; What’s New brings you to their product news; User Settings allows you to customize Insightly’s color theme and user details, connect an email account, create an email signature, manage your notification and sync settings and so forth. System Settings is where your administrator will spend time managing users, teams, permissions, opportunity states and custom fields, lead statuses and source, assignment rules, workflow processes, relationships, pipelines and so forth. The Insightly calendar works much the same as other web-based calendars — click and drag to create events quickly, click within the span to edit the details. You can filter the calendar to show the day, week or month and to show events, tasks and milestones. Insightly customers (that is, users of paid plans) can sync Insightly’s calendar to Google Calendar and Microsoft Exchange. Base positions its navigational panel horizontally over the page. This panel only shows icons of key features with hovertext indicating the name of the feature if your cursor lingers over the icon. There aren’t many, though; with short usage, you’ll soon gain familiarity with each icon. Base’s navigational panel positions icons left to right, starting with Dashboard, continuing with Leads, Contacts, Sales Pipeline, Calendar, Tasks, Communication Center and Reports. The Dashboard view shows an activity feed in the center; on the left you’ll see a snapshot of your total pipeline worth, forecasted revenue, active deals, hot deals, deal details for the last thirty days and top deals. On the right, you’ll see your due tasks and upcoming appointments. Base integrates with Google Calendar and Microsoft Exchange, and will show upcoming appointments from these synced accounts in your Dashboard feed. Base allows you to quickly create calendar events if you click and drag the cursor to establish parameters. Events made in external calendar apps appear in gray; events made within the CRM appear in green (CRM-specific events won’t show up in your external calendar). Clicking on the event allows you to customize additional details, set alerts, add attendees and deals. The top horizontal panel also has a button to check notifications and adjust their settings, a call button, search field and user avatar. Clicking the avatar opens a drop down menu with options including Settings, Manage Account, Manage Repository, explore information on the mobile app and options for contacting or finding support. Settings takes you to a screen where users and administrators can manage their account and profile, notifications, data importation, subscription and billing, custom fields for leads and contacts, pipelines, automation actions (a.k.a. workflows), integrations and others. Manage Account is an option within the Settings menu, and the Repository is where your uploaded documents or files are stored. User Interface comes down a lot to personal preference. Base and Insightly both make your key features available to you in an easily accessible toolbar. It takes roughly the same number of clicks to access the settings of any particular feature you need. Both systems were quick loading with the fairly minimal amount of data I imported — I can’t tell you how they’d perform with a large quantity of data — so I’d call this essentially a tie. Insightly allows you to select alternative color themes (and there’s quite a few) while Base users are stuck with the default color theme. If this matters to you, then give Insightly the edge in this regard. CRMs are far more than mere data repositories: they are increasingly communication hubs. Nearly all CRMs provide a function for storing and logging emails — some CRMs autolog emails by connecting with your webmail account, others require the use of an email string to include in outgoing and incoming correspondence. Still more platforms are integrating other channels, including calls, SMS and social media. Insightly and Base both attempt to address their users’ communication needs in different ways. Insightly is known for its email functionality. It provides personalizable templates out of the box, and users can create their own. Emails can be scheduled to be sent at specified dates and times, shared among team members, given custom tags, organized and searched, and automations can be configured to send emails in response to user-specified triggers (such as lead creation, unresolved tasks, activity updates, shared reports, etc). It’s enough to support basic email marketing campaigns, and for more sophisticated email marketing tools, Insightly’s paid plans integrate with MailChimp and can copy names and email addresses from the former to the latter. Insightly limits the number of mass emails that can be sent from a license. Free users can send only 10 mass emails per day — hardly ‘mass’ at all — while paid plans increase that number considerably. The lowest paid plan, Basic, can send 500 per day; the highest paid plan, Enterprise, can send 10,000 per day. (Differences can be found on their pricing page.) Bear in mind, there are some restrictions on how many emails an SMTP mail server or webmail provider allow their users to send per day. Details can be found here. Presumably, if your company used an Enterprise account, there would be far more than one email account connected to your Insightly license anyway. One very useful feature Insightly provides is it will automatically find the contacts of emails logged in the CRM. The correspondence will be attached to those contacts, so when viewing their profile page you’ll be able to see logged correspondence history. It will also add associated organizations for new contacts. The same applies for the recipients of emails for whom the email string is included in the CC or BCC field. One area in which Insightly falls short, in my opinion, is the lack of auto-logging emails. Users cannot send an email from within the CRM, and each email to be logged must include the account-specific email string provided, which is manually attached to sent, received, or forwarded emails. (Check out our short guide on Insightly email integration here.) Although the amount of time it takes to copy/paste the email string is very brief, it’s compounded over every email for each user, and when you take into account occasional memory lapses, it adds up to lost time and gaps in your email log. Base provides a robust set of tools for communicating within the CRM. Base provides 2-way email integration; users can send and receive emails from within the platform, which also auto-logs correspondence. Base separates emails from contacts and leads and those from senders not included in the CRM, which are categorized as ‘Untracked Emails’. In that category, users can decide whether to add the sender as a Contact or Lead. There are separate tabs for Sent emails and Archived emails. Each tab has management tools, a search field and filters. Users can select all and mark as read or unread, or archive; you can search by subject, and filter by emails associated with deals, or by sender type and pipeline stage. Base doesn’t come with built-in templates, but users can type out a message — using personalized merge tags — and save it as a template. Correspondence is also automatically logged to contacts and leads; when viewing a contact’s profile page (known in Base as a Contact Card) you can see the correspondence history and either add a note or send an email from the text field. The normal email rules apply; formatting and template tools are available here as well. Note: Base also provides an email logging string for unrelated emails to be added to specific Contact cards. Base does more than integrate 2-way email; it also integrates 2-way calling and SMS. Base autologs and records outgoing and incoming call; after the call is complete, users can add notes regarding the contents and the outcome. All this is presented on individual Contact Cards, where the audio can be replayed. In the Communication Center, calls are separated between Matched and Unmatched depending on whether the other party is recorded in the CRM as a contact or lead. They can also be filtered. As mentioned, Base also provides SMS integration; text messages can be sent and received directly from the browser. Outgoing SMS messages will be listed as coming from your Base Voice number. (Note: Details for acquiring a Base Voice number can be found here, their Base Voice billing policy here, and the rates as provided by Twilio are available here.) Calls and SMS can be sent from the mobile app. The field is pretty lopsided in Base’s favor when it comes to communication, although Insightly offers certain built-in email features that Base does not. Certain features are common. For example, both CRms allow users to create a professional email signature and both allow you to save email templates. Insightly provides five email templates out of the box, and it allows triggered emails through workflow processes (mentioned later). However, it doesn’t autolog emails nor offer 2-way emailing. Base, meanwhile, does not enable triggered emails nor provide built-in email templates. But email templates are easily found for free on the internet and Base lets you save an unlimited number of them. And 2-way email — especially functioning as smoothly as in Base — is too useful a feature to ignore. While triggered emails are essential for email marketing campaigns, both platforms integrate with MailChimp, so if Base users were committed to email marketing they could acquire the same functionality with the lowest paid MailChimp plan. Not only is it more convenient to send and log emails with Base, but Base also provides a way for users to log unrelated or unmatched emails to specific Contact cards, which Insightly cannot do. And if your business wants to reach out to customers by phone or text, and log those channels as seamlessly as email, then there’s no question about which platform performs best. My verdict for communications goes strongly in favor of Base. CRMs began as contact management tools — glorified Rolodexes. Of course, they’re far more than that today, but an essential feature of any CRM, from enterprise level down to part-time freelancers, is the ability to organize and categorize your contacts. Related to this is how well you can manage corresponding leads or tasks. Any comparison between two CRMs, including Insightly vs Base, should account for how well they allow users to manage their contacts and related tasks. Insightly’s Contacts tab in the navigation panel will open up a list view of all your contacts. On this page, you have tools to select multiple or all contacts for bulk actions — making bulk edits, or adding tags, links, notes, invitations to Google Hangouts, activity sets, sending emails, merging duplicates, changing Record owners, and so forth. This view is also filterable by tags, and you have options to import or export Contacts via Gmail, MailChimp, CSV, Excel file, Outlook or Act! 9. Notes can be imported via CSV file. An individual’s Contact page will show you several tabs: About, History, Emails, Notes, Files, Tasks, and Events. The About tab displays the Contact’s professional details as entered into the CRM as well as other contacts corresponding with that individual. The other tabs are fairly self-explanatory; History shows an activity feed relating to the Contact, Emails shows their record of correspondence, Notes, Files, Tasks and Events shows all such entries involving the Contact. This page also includes a button called Actions allowing the user to modify the Contact – for example, editing details, adding an image, changing the Record Owner, changing to a Lead, exporting via various methods, adding new tasks, events, opportunities and so forth. Changing contacts into leads, and vice versa, will delete the record from that category and merge all associated tasks, events, opportunities and so forth into the new record to prevent redundancy between the categories. Contacts and leads can be linked to specific projects or opportunities, which are then displayed on their profile pages. 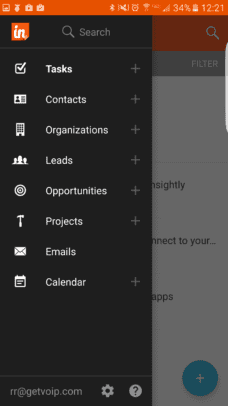 Insightly gives task management a separate tab on the navigation panel. The same page-level functions for Leads, Contacts, Organizations and Deals apply here, too — users can bulk select and mark as complete, change due date, change record owner and delete. On an individual level, tasks can be linked to additional records (contacts, leads, organizations), edit details, add notes or attach fields. Reminders can be set to repeat at intervals. Custom tags can be added to Contacts, Leads, Organizations, Projects, Opportunities and Emails to increase searchability. Custom fields provide uniformity to data entry, while custom tags are flexible and can be added more easily. Insightly allows 7 types of custom fields — text field, drop down field, date field, check box, numeric, URL or multi-line text field — which can be made visible and user editable. Contacts and leads views can be filtered according to custom fields. For more info on custom fields and tags, this Insightly support page compares the pros and cons of both. There are some limitations on records (and custom fields per record) according to the type of Insightly subscription. A record refers to a contact, lead, opportunity, event, task, project, organization, note, email and so on (details available here). The free Insightly plan allows only 2,500 records, 10 custom fields and 2 custom fields per record — a growing small business might chafe against this number quite quickly. The first paid plan – Basic – increases the limit to 25,000 records with 50 custom fields and 10 per record. Record limits continue to expand for higher tier plans. There is no standard plan to expand record limits without a subscription upgrade at this time; contact Insightly sales for plan-specific details. Base, which doesn’t offer a free plan, allows for unlimited leads, contacts, deals and tasks for all their plans. The individual profile pages, shown above, display a detailed view of the contact or lead — in Base, this term also includes organizations — with info including the record owner, customer or prospect status (or non-status), a text field for adding notes or sending emails (shown above), an activity feed, and any current deals, collaborators, upcoming appointments, tasks or documents. Editing the contact or lead opens a window with text fields for manually altering individual contact details. The general Contacts page allows for bulk selection and bulk actions, such as adding new or existing tags, mass emailing, adding to a call list, or filtering based on specified criteria. The Contacts page has separate tabs to distinguish between general contacts, prospects and customers. Data can be imported via CSV, VCF, Google Contacts, Outlook, LinkedIn, Mac Address Book and numerous other CRMs and webmail servers. Contacts and Leads pages have a separate tab for Smart Lists — customizable, filtered views that can be saved and toggled in a few clicks. They can also be exported as Excel files. Custom fields can be made from the Leads or Contacts customization pages, which are both accessible from the Settings page. Base allows custom fields of 11 types — single line text, paragraph text, number, checkbox, drop down, multi select, date, email, phone, address and URL — which can be made filterable, editable only by admin, shown on person or company cards (or not). Custom lead fields offer the same variety, and can be transferred along with other information upon conversion to deal, person or company. Meanwhile, custom tags can be added to leads, contacts and deals for increased searchability. Tasks relating to individual contacts, leads or deals can be created from the individual profile pages for those records. Users will be prompted to enter the task content, due date (if applicable), related records, owner and desired alert. Creating the task from the record will auto-fill some of these fields but they can all be adjusted manually. Base provides a distinct page for task management; tasks are filterable according to status, owner, relation and due date. Tasks can be added to this page and individual tasks can be edited. Insightly and Base approach contact, lead and task management with different but effective approaches. Insightly creates distinct pages for each type of record and allows records to be linked to other records or other owners within the CRM. Base allows this as well, and adds a Due Tasks module on the dashboard page — visually, it feels like a more integrated, diffusive approach. Insightly offers more tools for category-level action on records; such as bulk selection and edits. While Base offers category views on Leads, Contacts, Deals and Tasks, Insightly separates Contacts and Organizations, and adds a separate category for Projects – a total of six categories to Base’s four. Of course, whether you need a categorical distinction between Contacts and Organizations, and a separate one for Projects, depends on your company’s business focus and internal management style. A company that interacts largely with individuals might prefer the greater distinction, while one that interacts with companies as individual accounts might see no need. If you prefer oversight over shared responsibilities for specific accounts, tasks, projects or events, and would like to configure custom, automated notifications depending on the nature of the record, Insightly provides very useful tools for this. On the other hand, if your business is more sales-oriented, and your team doesn’t much require oversight for shared responsibilities on individual accounts — at least, not so much to necessitate category-level data management — and accounts as often refer to companies as individuals, without need for distinction, then you might prefer Base’s simpler interface. Sometimes, less is more. Conversely, sometimes less is simply less. Note that Insightly puts restrictions on the number of available records depending on the subscription. As mentioned earlier, a record is essentially any form of data entry into the CRM. The free plan is highly limited, and while the four paid plans successively increase the limit, only Insightly’s Enterprise plan offers unlimited records, which Base allows for all its plans. While effective data management practices should be the norm at every company, they’re essential for Insightly users; record limitations mean businesses must diligently deduplicate records, prune obsolete info, delete old emails and so on. Insightly facilitates category-level data export in various formats, so you can delete data from the CRM while keeping it for your records – but it’s a level of diligence Base doesn’t require. While Insightly users may be able to negotiate higher record limits on an individual basis, Base’s record limits aren’t reflected in the price. While the difference in record capacity is notable, it pertains less to the actual functioning of contact, lead and task management functions. Regarding functions alone, I would rate Insightly and Base equally; if your business is sales-oriented, and record limitations are something you’d pay to not worry about, you can comfortably give the edge to Base. CRM was historically built around three “pillars”: sales, marketing and customer service. A visualized sales pipeline affords sales teams a sense of progress among deals and exportable reports can provide management a customized, filterable view of sales performance by metric, account, salesperson and over a time period. While every CRM approaches this differently, the abundance of CRM solutions for all kinds of businesses — some of which may not even be so sales-oriented — means that various solutions implement this feature according to the needs of their user base. Insightly and Base follow suit. Insightly uses pipelines for project management and opportunity management. There isn’t a dedicated dashboard for a sales pipeline — users must navigate to the Pipelines tab in System Settings, which is found by clicking their avatar in the top right of the screen and selecting the option from the drop down menu. In this section, multiple pipelines can be created with custom stages. Each stage can be matched with an Activity Set — templates for automatic task or event creation — so stage-related responsibilities can be established and created by the CRM when a project proceeds to a subsequent stage. Pipelines can be configured to apply to Opportunities, Projects or both. The opportunities page will show a list of current opportunities with a small graphic indicating the current pipeline stage in light blue. Users must be familiar with the pipeline stages, because there is no text indication of the name of each stage. Clicking on an individual opportunity will open up their profile page, which is presented with a similar layout as the Contact and Lead profile pages. Users can edit the record, change its image, clone or delete it, and change the record owner. As with the other record categories, users can view all related correspondence and files. The pipeline stage is visible below the opportunity details — users can change the stage with a link to the right. In short, Insightly pipelines are not really interactive. They serve as visual indicators of opportunity or project progress with a degree of automation for reducing repetitive tasks. Base pipelines are more interactive, and following in the fashion of conventional sales-oriented CRMs, its Sales Pipeline gets its own page with a drag-and-drop interface. (To avoid confusion, note that Base refers to records in this category as ‘Deals’ rather than ‘Opportunities’.) However, in contrast to many CRMs, users cannot drag and drop a deal throughout the entirety of the pipeline from within a single page — they can only drop a deal to the subsequent stage via a green panel on the right. For a business that has a high number of deals, this could be a blessing. A common complaint with the visual sales pipeline in other CRMs — in which the pipeline can be viewed in its entirety on a single page — is the need to use scrollbars to get from one end to the other. This format might entail a bit more dragging and dropping but it could also reduce frustration with an otherwise halting user interface. Clicking on an individual Deal opens up its Deal Card. Users are greeted with a format similar to the Contact and Lead Cards. You can leave notes, send an email, or open up a Client Space, which is a personalized web portal for collaboration and file storage relating to a particular deal. 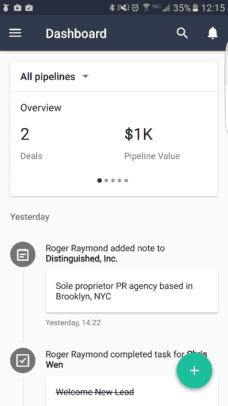 This profile view shows the value of the deal, its date added, likelihood of closure, associated contacts and collaborators, upcoming tasks and appointments, an email link to log outside emails to the deal and an activity feed of related CRM activity. Users can create new pipelines from their Settings page, which is accessible from the drop down menu that opens from clicking their top right avatar. Here, users can create new pipelines, customize stages, and add users or custom fields. Base pipelines are all distinctly sales-oriented. Stages are required to have a percentage of win likelihood, and while you can add as many stages as you’d like, there is a non-customizable ‘Closed’ category of stages. Stages within this category can be edited, but neither added nor deleted, so users always have three options to describe the outcome of the customer journey. The default stages are Won, Unqualified and Lost. The differences in pipelines between Insightly and Base again reflect their different targeted business use cases. Insightly pipelines are useful, at-a-glance reminders of which phase of a user-defined process a project or opportunity currently occupies. Base pipelines are more heavily aimed towards salespeople — which is evident given its name — which is filterable by actionability, tags, estimated close date, owners, collaborators and source. Smart Lists are also available and can be exported as an Excel file; Insightly opportunities and notes can be exported as a CSV file. More tools exist to filter Base records based on pipeline than for Insightly. However, the platform you’ll favor will likely depend on the same reasons you favored one over the other for the Contact, Lead and Task Management; your business use case, whether it depends on project management or sales. Project managers will favor Insightly due to an emphasis on notifications for, and solicited feedback from, key stakeholders; sales teams would favor Base for putting Deal-relevant information front and center. Therefore, for project management, the verdict for pipelines goes to Insightly; for sales, it goes to Base. 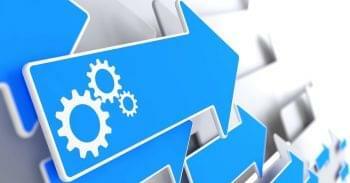 A key feature of modern CRMs is the ability to automate repetitive tasks. The axiom “time is money” only ever applied to business, and countless seconds and increments of mental bandwidth are wasted with routine, regular mouse clicks. A CRM worth its salt will find a way to minimize data entry and automate task and event creation to produce maximum output for minimal effort — allowing your team to focus on the profitable aspects of their work instead of getting files and forms in the right order. Insightly and Base both provide automations to some degree. Let’s see how they stack up at minimizing unprofitable busy work for their end users. Insightly provides a high degree of automation customizability. Tasks and Events can be created upon Lead or Contact entry and upon Project or Opportunity progression to the next pipeline stage. Contacts can automatically be created when website visitors enter their data into a web form. As mentioned, emails can be automatically sent out according to specified triggers. Activity Sets, found in System Settings, automate task and event creation. Activity sets can be tied to Pipelines so that user-specified tasks or events are triggered when a project or opportunity progresses to the next stage; if you and a lead scheduled a phone call, you would advance the opportunity to the next pipeline stage, which prompts the CRM to add the subsequent ‘to do’ activities — whatever you specified in the set. Activity Sets are present in all Insightly plans. Workflow Processes, also found in the System Settings menu, grant a higher degree of specificity and control to users. While Activity Sets apply to opportunities and projects, Workflow Processes pertain to tasks, contacts, organizations and leads as well as opportunities and projects. These can be configured to send emails, create tasks, change values in a record or add new records. They are based on ‘if’ and ‘then’ statements; for example, if a contact is added as a customer, the CRM can add a task and send a follow-up, pre-configured email. If the contact is a vendor, it will update the contact’s billing ID and create a task. 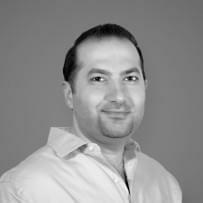 Workflow Processes are only available in Insightly’s upper-tier plans, Professional and Enterprise. Insightly provides other forms of automation, such as a web-to-contact feature that creates HTML code to be placed on your site. Specific fields can be presented to the website visitor (first and last name are required), contacts can be made less visible to non-admin users, the HTML code can be customized as can the Thank You page after the visitor completes the form. And, of course, Insightly provides a high degree of email automation. In addition to the Workflow Processes mentioned above, the email templates and scheduled mass emails — which are available with varying limitations for all plans — make drafting and sending routine correspondence or marketing emails very simple and quick. Base provides automations for notifications, task creation and contact creation. In addition, certain functions already described can be considered an automation of a sort. Base provides preset and personalized notifications that can be toggled by individual users and sent via web alert and/or email alert. The preset notifications relate to record assignment (leads, contacts, deals and tasks), reminders on appointments and tasks, and system messages — when data imports and exports are completed. Personalized notifications allow users to define what account activity prompt alerts; users can choose between leads, contacts and deals, and filter those records based on ownership to users, teams and groups, status, lead score, pipeline stage and so forth. Web notifications via browser can be set for incoming calls and text messages. Automated actions create tasks in response to lead, contact and deal creation or deal movement between pipeline stages. Users can select task name and owner assignment. Base also allows automatic contact creation from lead capture forms that can be hosted as a subdomain on your site, embedded in the HTML code or enabled on Facebook by activating integration with the social media network. In a sense, Base’s sync with email accounts like Gmail, Outlook and Exchange is a form of automation — rather than manually logging emails, calls and SMS, they are automatically stored in your CRM inbox. These features were discussed earlier but are worth mentioning here. Insightly offers more customization in its automations for users, in terms of defining triggers and outcomes. Base offers fewer built-in automations, but makes them easier to configure. Insightly’s automations must be configured by the CRM administrator, while Base’s seem to be set by individual users — allowing greater individual control over the types of notifications received. In a strict measurement of how much the CRM can be programmed to perform tasks entirely on its own, Insightly has a clear edge over Base. Insightly could hypothetically be programmed to initiate and execute a timely, personalized email marketing campaign based off a single trigger. Base, while certainly packing automations of its own, cannot do anything like that. CRMs prove their worth with all the ways they can organize and filter data, automate repetitive actions and finally, produce actionable reports that enable businesses to course-correct based more on hard facts than intuition. CRM reporting has traditionally been a practice of descriptive analytics – informing users to what happened at which times. As data analytics improved, reports became more diagnostic. Now, with advances in artificial intelligence, analytics can become more predictive and prescriptive — in other words, forecasting conditions our business will face and offering suggested courses of action. Reports give coherence to otherwise indigestible reams of big data. Insightly and Base provide reports in their own fashion. Insightly offers a great deal of customization for its reports. There are built-in reports for all its record categories — Task, Contact, Organization, Lead, Opportunity and Projects — and a category of ‘Other’ reports, which includes reports on Events, Files, Notes and User Activity. Essentially, every datum within the CRM is up for grabs; multiple filters can be dragged and dropped from a list of related properties or linked records. When users apply three or more filters, they can trigger Filter Logic; this is essentially a user-directed specificity regarding filters they’ve chosen to apply. (Insightly has a support article explaining filter logic in detail.) Advanced reports are unlimited in all paid plans, but the Insightly free plan restricts the number to 10. Insightly reports are granular and customizable, but they cannot be described as ‘visual’ — there is no built in function to present CRM data as a chart. Insightly does, however, provide an official integration with Microsoft Power BI account. Users who have, or are interested in, a Power BI account can access their Insightly data within the business intelligence platform to create and customize their own visual reports and dashboards. Base provides its own tools for reporting on CRM data. The reporting functionality is robust enough to redirect users away from the standard CRM page and towards a distinct Reports page, replete with its own toolbar. The toolbar provides built-in functions for Pipeline Analysis, Sales Performance, Activity Reports, Goals, Advanced Sales Insights, Success Insights, Marketing Effectiveness and Voice. Each category provides anywhere from two to seven distinct reports; there are a total of 34 built-in reports overall. Users can toggle between visual charts and lists, reports can refer to time periods of user specification, and reports can be filtered by pipeline, ownership, tags and sources. However, these reports are not available with all plans. In fact, the lowest paid plan doesn’t provide reporting at all. The mid-tier Professional plan includes Sales Forecasting and Activity Reports, but only the upper-tier Enterprise plan gets Sales Intelligence and Call Analytics. Also noteworthy is Base CRM’s 2016 reveal of Apollo — an artificial intelligence ‘Sales Science’ platform for applying high-level diagnostic and prescriptive analytics to your sales data and offering suggestions to improve efficiency and drive sales growth. This platform is not included in any plan and must be separately requested. If we’re comparing the built-in reporting functionality of each platform, then Base offers better capabilities, but you’ll have to pay for it. Base’s Enterprise plan comes at no small cost — it’s $26 more per user/month than Insightly’s Enterprise plan — but the reports are polished, highly detailed and fairly customizable. Insightly’s reports are highly customizable but strike me more as a powerful, filterable data lookup feature than reporting – until you visualize it with Power BI. Then you’re able to see trends over timeframes and your data becomes a lot more useful. Considering there’s a free version of Insightly (even with limited advanced reports) and a free version of Power BI, I’m comfortable saying that there’s potential for Insightly to give you detailed, visualized reports at far less cost than Base. A sales team looking to rely on their CRM reports would do well with Base’s Enterprise plan, even though it’s not cheap. (There also isn’t publicly available pricing info for the Apollo platform.) Users for whom reporting isn’t an essential focus of their CRM and are content with what amounts to a powerful search function — with visualizations a mere one integration away — Insightly gives you plenty at low cost. CRM has moved away from traditional desktop or laptop-based business — mobile users account for a large and growing proportion of email usage, social media usage and overall business communication. CRM solutions have adapted by offering native mobile CRM apps that enable access to CRM data and functions on a mobile device. I have an Android device, so I was unable to test the iOS apps, but here is my comparison of the Insightly vs Base mobile apps. 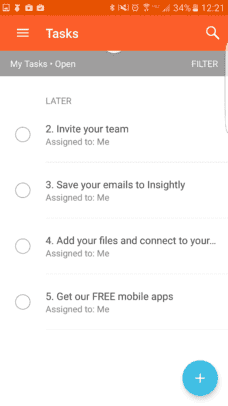 Opening the Insightly mobile app — after you login and the app syncs your data — greets you with your open tasks. Users can search them, filter, mark them as complete or press the icon in the top left to open their toolbar. This toolbar provides views to the record categories of the browser-based CRM; in order words, your CRM data will all be there. Certain functions don’t transfer to mobile; for example, users cannot customize automations or manage integrations. However, users can view and edit their calendar, tasks, projects, contacts and leads. Emails can be checked, but as with the CRM, not sent. If you open an email and press the email link, your phone will open its default mail browser. Clicking the email icon in the Contact form will open your sharing options. The Insightly mobile app has a built-in function to scan business cards to import as a contact or lead. It’s not performed by any algorithm; there’s a person on the other end who will transcribe the details and save them to Insightly for you. It takes a bit of time, and business cards must be in English, but it’s a useful feature. Finally, in their Settings, users can enable or disable task reminder notification, access their email logging string, sync their data or log out. In the Google Play store, the Base mobile app has over 100,000 downloads, a 4.3 rating over 1,788 votes, and describes itself as “the next-generation CRM designed to boost your sales productivity.” On their Wikipedia page, Base includes as an accolade a reference to a 2012 TechCrunch article that stated Base was “the first small business CRM with a true full native Android app [which] appears to be the first CRM in the Android Market.” (They also had an iPhone app.) So Base was early to the mobile CRM game. After logging in and syncing your data, the Base mobile app dashboard presents you with a pipeline snapshot and an activity feed. The snapshot can be swiped to display a pipeline overview, or a focus on the current week, month, quarter and year. The activity feed, of course, can be scrolled. 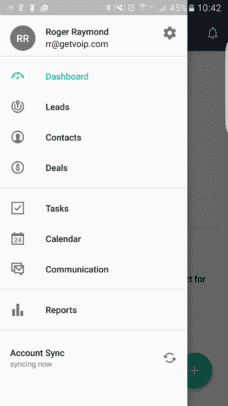 Clicking on the icon in the top left opens the toolbar, where you can access, view and edit your Leads, Contacts, Deals, Tasks Calendar and Communication. The four main record categories can be viewed, edited, searched and filtered; the mobile app also provides geolocation for users to get a sense of location relative to their contacts or leads. In the Communication Center, Base mobile app users can add email accounts and sync with their phone logs to review and log calls and texts. Adding an email account allows you to use templates, rich text, merge tags and email tracking. In Reports, the Base mobile app can filter for all users or selected ones; provide a snapshot and in-depth forecasting and total sales reports within a date range, filter sales by account and by owner and display your sales funnel. There is also a report on lead statuses. In Settings, users can enable automatic sync, sync over WiFi, clear their cache, change default settings for recording and logging calls, ignore certain numbers, change notification settings, adjust the unit system for maps (miles or kilometers), integrate Android contacts… it’s an extensive list. Base is known for its mobile CRM so it should be no surprise their mobile app is better than Insightly. I was impressed, however, by how good it is. While there is some reduced functionality common to both mobile apps — such as creating automations, which simply seems easier to do with a keyboard and mouse — and all the essential data and functions are there, the difference in built-in capability is compounded when viewed in the context of mobile. For starters, while Insightly needs to open an external email account and users must copy and paste their email logging string as usual — which is more frustrating on mobile — Base mobile users can add their email account and send emails as usual from their app. And for those with a dedicated work phone, the automatic call and SMS sync will draw up numbers from the phone for manual association with contacts or leads. This can be time consuming but the option is better than none. For certain businesses, the geolocation might not be important, but for others it’ll be essential. There’s no need to open an external map application when locating a contact whose address is stored in the CRM. And being able to draw upon visual reports on the fly — even simple ones — is a desirable feature. Insightly grants you mobile access to your CRM data with some editing functions, but Base truly offers mobile CRM. A CRM cannot do everything, nor should it. There are plenty of business functions outside the purview of a CRM that serve our business needs better with access to our CRM data. Plenty of CRMs offer official integrations with popular business apps; some offer more than others. Aside from its 2-way email, call and SMS integration, Base offers integrations to expand CRM functionality for email, marketing, document management, contact sync, customer service & support, accounting and sales. Integrations are hard to compare because evaluation depends on what your business currently uses (or needs to use). Many businesses use Zapier as a workaround for CRM workflow limitations. This may continue to hold true for either Insightly or Base if they don’t offer an official integration with app you prefer for the functions you need. On the surface, Insightly offers more integrations, but Base integrates with large, well-known business solutions, notably HubSpot for marketing and Zendesk for customer service. Since the value of these integrations is entirely circumstantial, I rule this one a tie. There’s a lot to be said for both platforms. 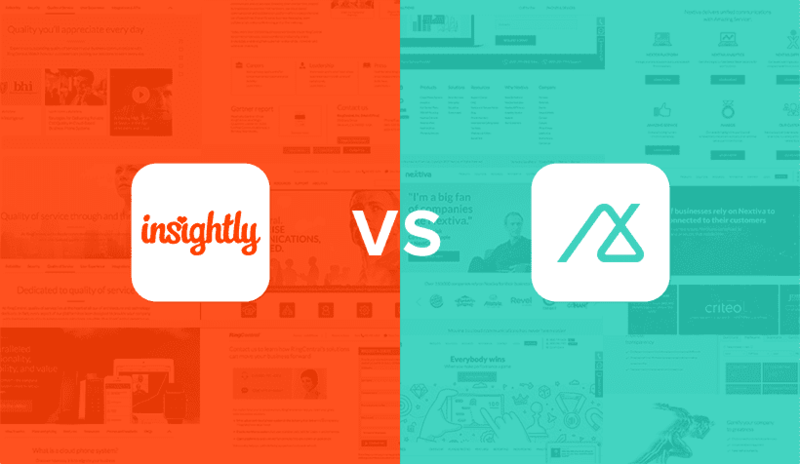 If you’ve read this entire head to head comparison of Insightly vs Base, you understand by now that each platform offers solutions for quite different use cases. If your business needs focus on project management and effective delegation of responsibility for shared tasks, as well as a need for customized, triggered emails — such as newsletters or email marketing campaigns — then you would probably prefer Insightly. On the other hand, if your business relies on individual salespeople — particularly mobile ones — then Base is the choice for you. After all, one of its core features — its Sales Pipeline — is irrevocably sales-oriented. Its built-in Reports function offers highly granular sales metrics in a visual, filterable and digestible format, with the option of signing up for the growing Apollo A.I. platform. Its mobile app is not merely a mobile-friendly port of its browser features, but takes advantage of mobile capabilities (GPS, call and text logs) to offer geolocation and supplement CRM data with auto-logging for calls and SMS. Sales CRMs often tout their ability to provide essential functionality within the same platform; Base achieves this by integrating 2-way email, calls and SMS from within the browser; with a headset, a salesperson feasibly need not leave the application for their core work functions and then some. If there were some way — or reason — to tally up all their functions and score them in a manner that measured their usefulness, I would say that Base is the more powerful platform. Then again, if you’re a fish, it doesn’t make a difference if you have a mountain bike or a tricycle. With patience and an able administrator, Insightly allows you (on its upper-tier plans) to automate a high degree of functions from its CRM. So, if you’re using your CRM for email marketing, and contact, lead, opportunity, task and project management, Insightly provides a converse opportunity to Base — you could feasibly spend as little time as necessary within your CRM while it works on its own. Different needs, different platforms. To recap: if you’re both sales-oriented and need mobile CRM, Base is the clear winner. However, if you rely chiefly on email marketing and need an affordable CRM with effective contact, lead, task, opportunity and project management tools and highly customizable automations, then Insightly is the one for you. For another head to head CRM article, check out our review of Zendesk vs Freshdesk. For overviews, comparisons and user reviews of CRM software, be sure to visit our CRM Software Comparison Guide.